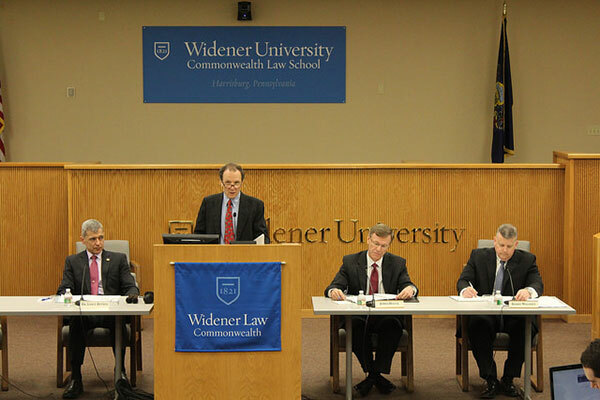 Nearly 100 active duty soldiers, veterans and lawyers gathered at Widener Law Commonwealth to discuss critical military law issues affecting soldiers and veterans. Panel participants included high-ranking military leaders, renowned military law experts and administrators of organizations offering services to veterans. The symposium, titled The Military, the Law and the Constitution, featured three panels: Ethics in Military Law; Constitution and the War on Terror and Taking Care of Our Servicemembers and Veterans. The keynote address of the symposium was given by the Honorable Patrick J. Murphy, Acting Secretary of the U.S. Army. Murphy is a 1999 alumnus of Widener Law Commonwealth and the first veteran from the second Iraq war to be elected to the U.S. House of Representatives, serving Pennsylvania’s 8th Congressional District from 2007-2011. Click on the links below to watch the panel presentations. View photos from the Military Law Symposium.